Title of this post is a famous quote by Ralph Waldo Emerson. On March 8th, Jim Tressel addressed the media (in a hastily thrown together presser) to own up to and apologize for covering up information about five players who had allegedly traded autographs and memorabilia for free tattoos. Not only that, but also misleading investigators and his bosses about what he really knew versus what he said he knew. It seemed as if the cat was finally out of the bag. Tressel found himself in an awkward position of getting some damning information about his star players, and admittedly not knowing who to talk to about it. He said that he kept the information confidential because of the possible legal nature of the subject matter. As it turns out, those emails Tressel received from Christopher Cicero were not kept to himself. A Columbus Dispatch report is now saying that those emails were forwarded from Tressel to Ted Sarniak, a long-time mentor of Terrelle Pryor. During a news conference on March 8 to announce NCAA ethics violations by Tressel, the coach said he kept the information to himself to protect the confidentiality of the federal investigation and for the safety of his players. But Tressel also nodded his head and said "um-hmm" when asked whether he had forwarded the emails to anyone. Ohio State athletic director Gene Smith quickly intervened to prevent Tressel from answering that question about the matter currently under investigation by the NCAA. 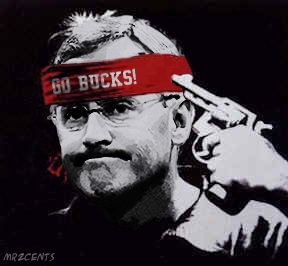 It struck me as very odd that Tressel would voluntarily increase his own punishment from a two-game suspension to a five-game suspension. What did he know? An attempt to get in the good graces of the NCAA because he knew more bad news about to drop? Because Bruce Pearl was just fired? A guilty conscience, perhaps? Hard to believe that this can just keep getting worse for Sir Teflon. But it does. The more that gets uncovered, the dirtier he looks. I just don't understand why this man just can't stop lying, or bending the truth to suit his own interests...especially when the NCAA spotlight is focused on him.